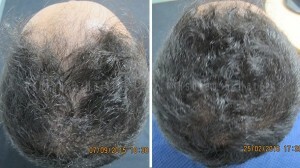 Here’s another hair loss prevention case study. Thirty-one year old tradesman, Aarav had been losing his hair for a year when a friend recommended Ashley and Martin to him. His friend was a client of Ashley and Martin’s and had regrown his own hair with a RealGROWTH® hair loss prevention program several years previously. Aarav would have never known his friend had been suffering from male pattern baldness to look at him and began to think about calling Ashley and Martin. A month later Aarav was up late and decided to go to the Ashley and Martin website. After looking at all the information available to him, he filled in the online enquiry form. The next day he received a call back from a representative and he booked in for a free hair loss prevention consultation at his local clinic. He came in to speak to a consultant about the family pattern he was following; both his brother and father had lost their hair in the frontal region. After diagnosing him with Male Pattern Hair Loss, Norwood type IIa, the consultant explained how a RealGROWTH™ hair loss prevention program could help Aarav keep the hair he had left and regrow the hair he had lost at the front. Aarav decided to give the treatment a go and signed up straight away. Aarav’s girlfriend came with him to his 4 month’s check-up appointment. She was concerned about what would happen at the end of his program if there had been no improvement. The consultant reassured her that Aarav was in good hands and the hair loss prevention treatment was already working after only 16 weeks. New photos were taken of Aarav’s hair and put up on the screen alongside the original photos for both Aarav and his girlfriend to see. Both could see that there had been significant improvement in Aarav’s frontal hair line. Having the photographic evidence to support the success of the program made Aarav’s girlfriend feel less nervous about trusting the program would work and the couple left the office delighted with the results they had seen. A 47 year old Caucasian male presented with approximately 5-10 year history of hair loss throughout the scalp. 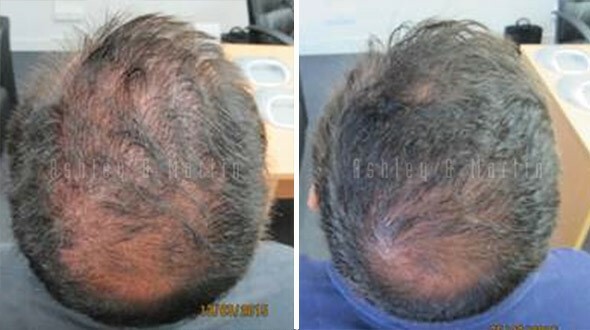 Patient reported a steady decrease in hair density around the frontal and crown areas. He reported no follicle inflammation, pain or itching. Some previous over the counter treatments had been trailed with no success. Treatment then commenced, patient was prescribed a topical Realgrowth formula applied to the scalp at night, oral DHT inhibitors & Laser cap was issued. Examination five months into treatment patient reported ease of use and a significant decrease in overall hair loss. He also revealed significant increase in overall hair density. He experienced substantial improvement in size of vellus hair, the number of which also multiplied. Visible changes were made across the temporal, frontal, mid-frontal and crown. Patient is continuing with hair loss treatment and will be expecting further result in the coming months. 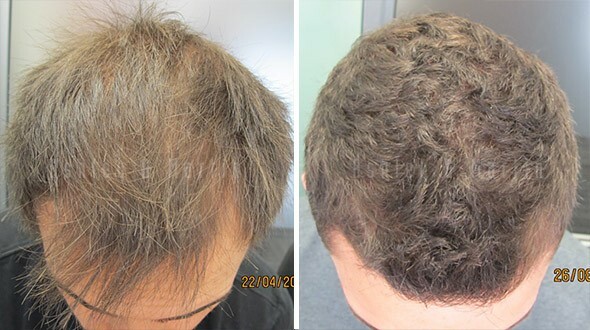 23 year old male presented to the Ashley and Martin Perth clinic late April 2015 with no previous treatment for hair loss and was greatly concerned he would lose all his hair if he did not take control of the situation to start hair regrowth. Client was in good health with no past or active medical problems. Client had used medications for three years although ceased two years ago which could contribute to loss. Client’s family history shows male members on the father’s side of the family experiencing hair loss with various levels of aggressiveness. Diagnosis is male pattern baldness, Norwood early stage 3 Vertex due to the visible thinning on the hairline and crown leaving the back and sides intact consistent with MPB. Due to the amount of visible hair showing cells are still active in the area treatment is considered greatly viable for hair regrowth. After a full consultation discussing all available options and an in clinic specialist visit, the client decided to move forward by starting on an Ashley and Martin Realgrowth medical program to promote hair regrowth the following day. At the 4 month check-up the client advised he had been using the products as prescribed and found it easy to do so leading to fantastic visible improvement.